Carbocations are ions of organic molecules that carry a positive charge on the carbon atom; these carbons atom are sp2 hybridized (three orbital sp2 and one p empty orbital, perpendicular to the plane made by the sp2 orbitals. 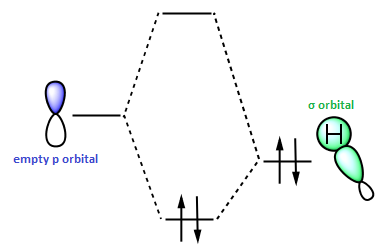 The hyperconjugation is the interaction between a σ bonding orbital (typically C-C and C-H ) and other orbitals, usually p orbitals (which is the case, for example, of carbocations) or empty adjacent π orbitals. This type of interaction allows to distribute the electronic density, obtaining more stable forms. Let's consider the specific case of the carbocation . Recalling, once again, that is sp2 hybridized , it has trigonal planar structure with an empty perpendicular p orbital, which, besides, carries the positive charge. 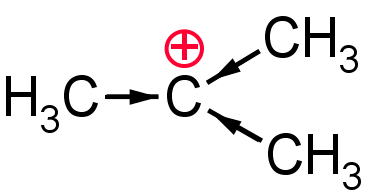 If there's another adjacent carbon to this (ie in position β ) it is realized a partial overlap between carbon's σ bonding orbital in β , and the empty p orbital of the positively charged carbon (carbocation). The central carbon, who carries the positive charge, is more electronegative than surrounding sp3 hybridized carbons . It follows that the bonds between sp3 carbons and the sp2 carbons are shifted in favor of the latter. The electron density is therefore delocalized from the alkyl group (-CH3 in this case) to the central carbon, with a complexive stabilizing effect on the carbocation, as if the positive charge of the carbon sp2 was dampened by the electron density from the adjacent groups. This effect is obviously not exclusive prerogative of alkyl groups, and may also be either stabilizing or destabilizing . For example, an "electron-withdrawing group" as -NO2 , would have a destabilizing effect on the carbocation, because it would tend to "attract" the electron density, and not to give it, further accentuating the unstable state of the sp2 carbon. The hyperconjugation and inductive effect concepts allow us to effectively explain the different stability of the simplest carbocations, therefore primary, secondary and tertiary. the resonance formulas don't describe a static structure, rather a dynamic system where charges spontaneously moves one towards the other. For this reason, sometimes the electrons of the π bonding-orbital flock in an empty p orbital of a carbocation causing the displacement of the positive charge on another carbon, while the next moment it's exactly the opposite, so that is almost totally unpredictable . The resonance formula that best describes the carbocation is the left, since the secondary carbocation is MUCH more stable than the primary one. In general, the more are the resonance formulas with which a molecule or ion can be described, the lower is the overall energy, since the charge is highly delocalized. In this case the more stable resonance formula is the one that bears the positive charge on the oxygen. The atoms that have electronic doublets bears better than carbon a positive charge (the lowest energy of the true carbocation and right).